As a pet owner, you’ll find out very quickly that your animal loves to roam. More often than not, they prefer to venture to rooms that are strictly off limits. And of course, they’ll always push their luck when you’re away from home. 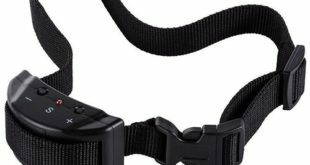 This can create problems, since your dog or cat will definitely want to cause a ruckus. This is one of the many reasons that a lot of consumers invest in a retractable pet gate. 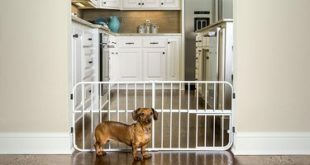 With one of these gates, you’ll be able to block off a specific area of your home to keep your pooch or feline confined to one area. Additional details about retractable dog gates and their utilization will be provided below. When thinking about a gate, you’ll generally ponder the gates you see outside. Outdoor gates that prevent intruders from entering your property tend to be heavy and difficult to install. The indoor retractable pet gate is very simplistic and easy for everyone involved. They have a very basic setup and generally rely on pressure to keep them upright. 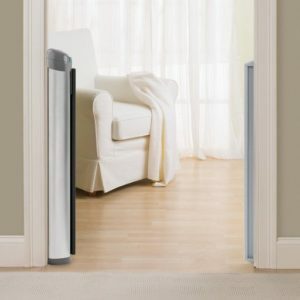 Simultaneously, this helps to prevent your home’s walls from being damaged. In most cases, you will need little to no tools to get the dog gate installed and it shouldn’t take more than a few minutes. Below, you’ll find tips for getting the right gate and getting it installed correctly. 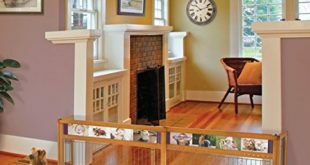 Now that you’ve learned a little more about indoor dog gates, it is time to get started. First and foremost, you’re going to need to get the right date for your home. Figure out precisely where you intend to install the gate. For the sake of size, it is generally best to choose a hallway or doorway. Grab a tape measure and take precise measurements of the entryway. This will give you reassurance that the gate you choose will indeed work for your unique situation. Some gates are longer than others and extensions can sometimes be purchased. Therefore, it is easily possible to use a gate to block off bigger areas. While the installation procedure can vary from one gate to the next, it is usually fairly simple. The indoor doggie gates should come with wall protectors. These should be attached onto the walls in the area of installation. Secondly, the gate will have turn knobs or screws on the end. The knobbed end should slide into the wall protector. Once this is done and the gate is positioned in the appropriate location, you need to continue turning the screw to increase the pressure. Turn all four knobs equally. Stop periodically to check the stability of the gate. Once the gate is stiff and doesn’t wobble, you’re finished. Be careful of tightening the knobs too far, as this could damage your walls. Once you’ve finished, you’ll want to let your dog inside. 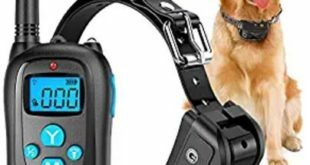 Now, position yourself on the other side of the gate and watch your dog’s behavior. The dog will mostly likely push on the gate and try to reach you. Make sure the gate is capable of withstanding the dog’s weight and pressure. If necessary, tighten the knobs even more. Simultaneously, it is wise to retighten the knobs periodically, since they may loosen with time.